Few know the first name of this designer of genius, Ernest Mauviel, however, the products manufactured in his traditional workshop, founded in 1830, are well-known, the world over. His descendants have inherited his great passion. 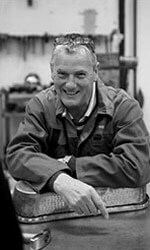 Seven generations separate Ernest, the Founder, at the start of this great adventure, to Valérie, today, this company is the flagship, of the Bay of Mount St Michael, it glorifies the kitchens of professionals and individuals, in France and abroad. Its exceptional know-how is the master trump of its success, and its skill to adapt, its vault. 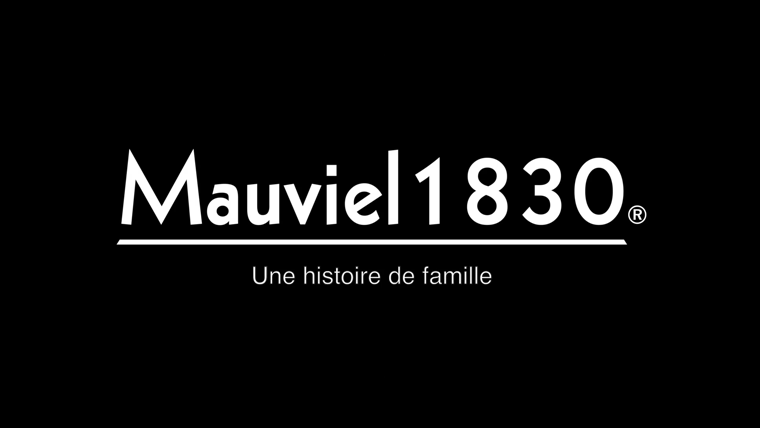 For almost two centuries, Mauviel 1830 adapts to the ever -developing market. Mauviel 1830, has the ability to flourish and anticipate the culinary tendencies, while preserving its DNA. 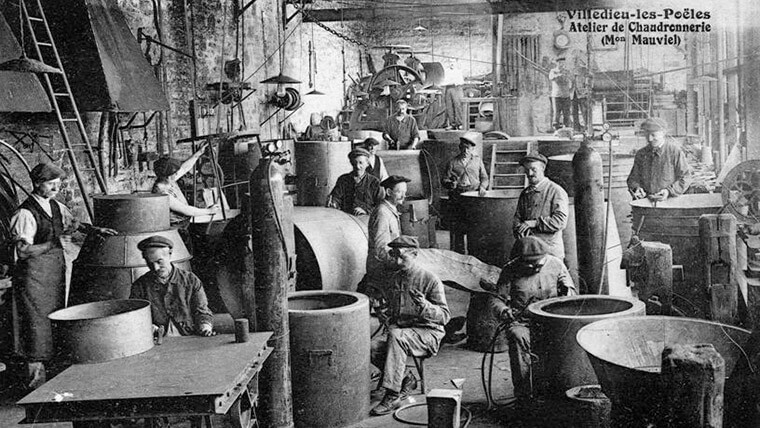 The goods, destined to professionals, were originally manufactured in copper, a noble material, by definition, the best of, the heat conductors. Far from sticking to the red metal, the company has found the ability to innovate and diversify, crafting with materials such as steel, cast iron, aluminium but mostly multi-layers stainless steel, which performances equal those of copper. Thanks to its innovating and modern spirit, Mauviel 1830 is the sole company, in the world, with the know-how to shape so many materials, ranking it, at the highest level of excellence. 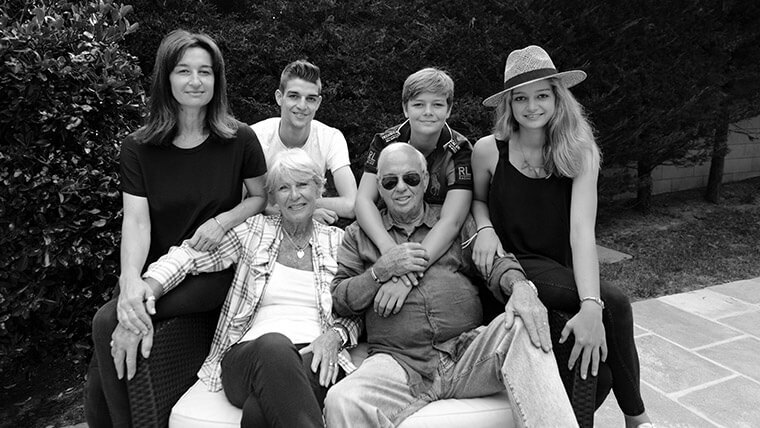 In 2006, Valérie Le Guern Gilbert, 7th generation in the Mauviel linage, takes over the family run business, and insufflate renewed energy. She focuses on the manufacturing process, and its optimization, she is passionate, about. 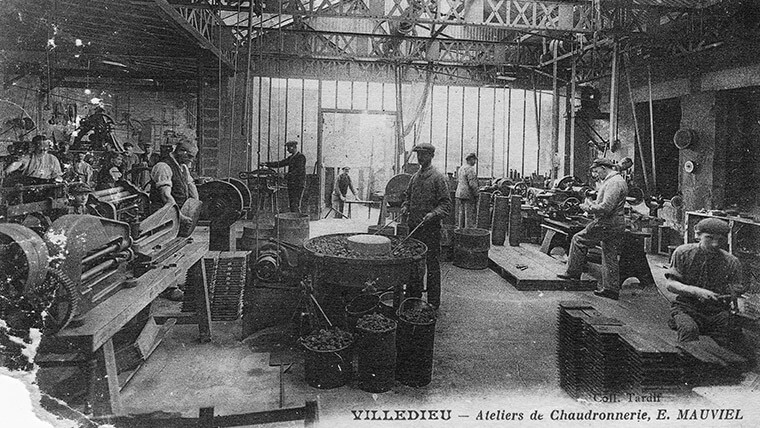 But beyond her involvement in the manufacture, Valérie, is active on many fronts. She commits to recapture foreign markets, to boost the company, she hallmarks all the products of the brand name Mauviel 1830, as a sign of excellence. She puts in place a high standard communication system, each stage, is the object of special attention: the product, the packaging, the communication. Deeply attached to the value of progress but in keeping with tradition, the company shows real modernity in its designs for the very demanding world of gastronomy. Visionary, Valérie is a specialist in the commercialization of her products, and is a real success with top chefs, charmed by her collections of cooking utensils. Valérie is the living proof of a successful manufacture, almost bicentennial, which has so beautifully remained loyal to its tradition, while imposing modernity, and has won over the trust of well- known chefs and the general public. 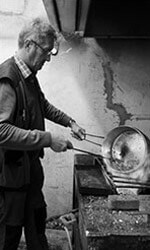 Every day, 70 craftsmen carve, assemble, hammer, strike, polish, stamp, shape 1300 utensils of the brand. 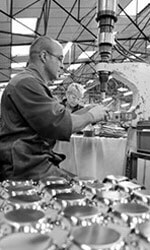 The company continues to provide, for the last 200 years, the same standard of quality for all its collections. 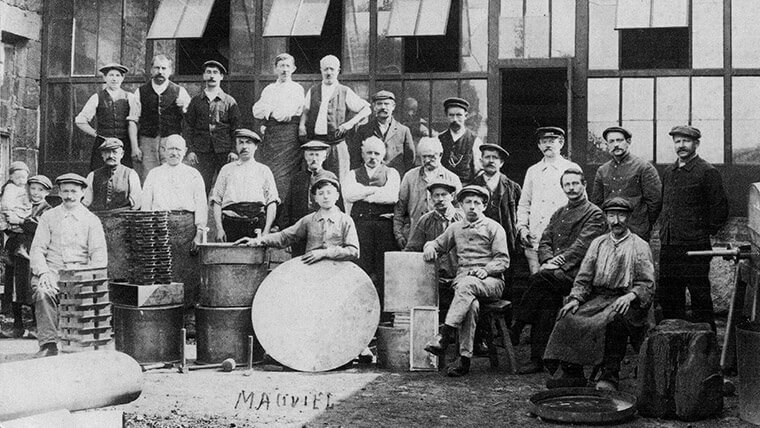 At Mauviel 1830, the professional operates in a spirit of transmission to the next generation. 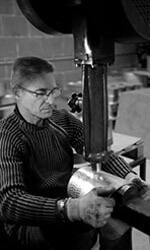 Each person learns to use the right technique, for each stage of the making of the pieces. 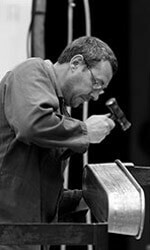 Every word vehicles the idea of heritage, the will to respect the values, from their first day with the company, the values of tradition, and know -how, with a special focus on the “made in France” and the craftwork at each stage of the creation. This gesture has not changed for the last 200 years, in total respect of the know-how, the team Mauviel 1830 has won its bet on the future: bringing together tradition and modernity, reconciling classic and contemporary, for our cooking to make sense: a heritage, deeply valued, for a future to the image, each craftworker has planned. Making wonderful plans, with sharing in mind, constantly. This is what cooking is all about, sharing every day, it brings together generations, it unites children and adults. 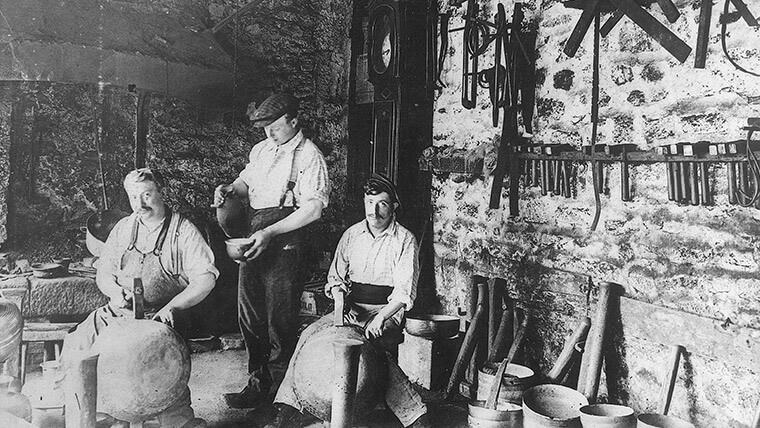 The cooking utensils Mauviel 1830 have accompanied these generations since 1830, to achieve their role of conveyor of happiness. Has been working for the company, for 41 years. 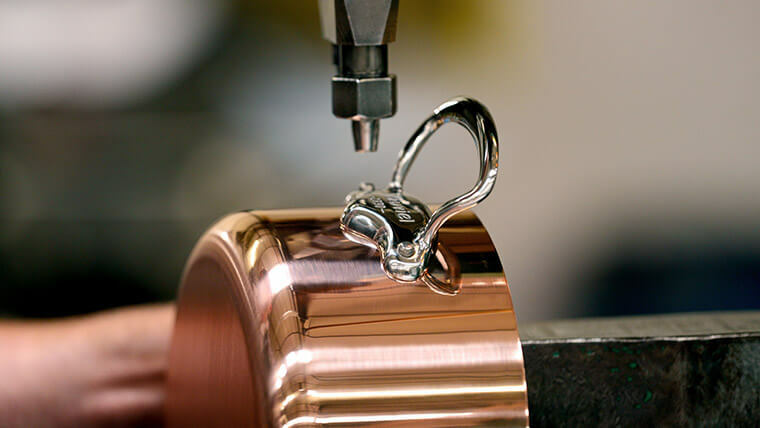 Now working as a coppersmith, he worked previously, in polishing, microparticles, assembling. This position is a new adventure. Has been a polisher for 10 years. Was trained in polishing, in-house, loves his job. 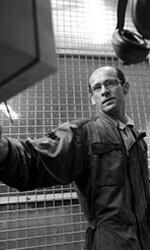 He is, now, the role model in polishing technique. Has been working for the company, for 23 years. Has been working for the company for 20 years. 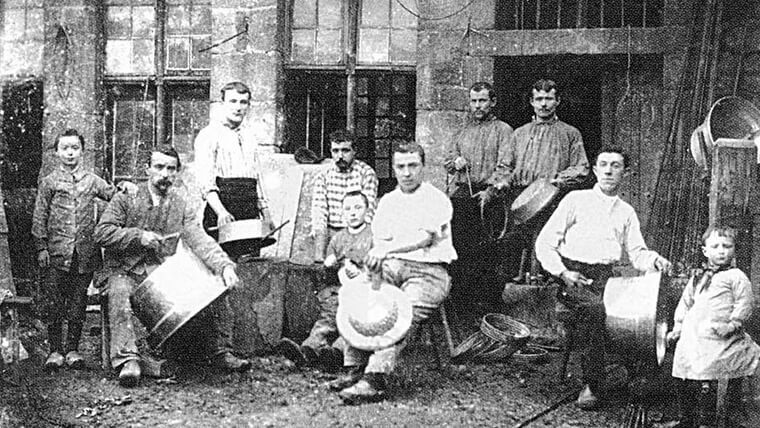 The know-how of our craftsmen is a real gem, transmitted from generation to generation, in Villedieu Les Poeles, since the XIth century. 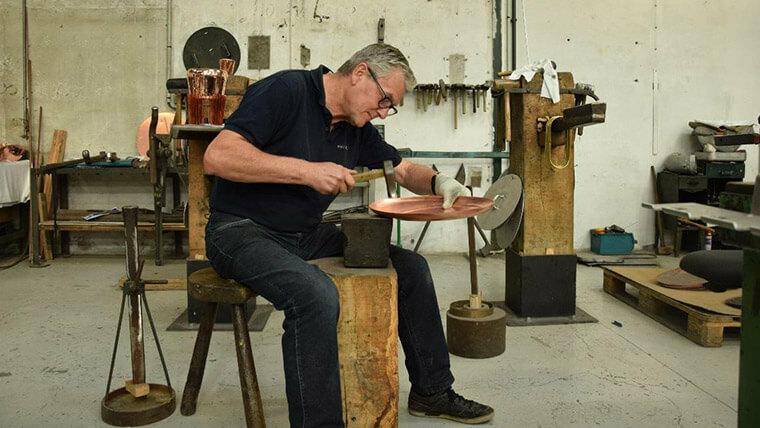 In 2017, the profession of coppersmith – chaudronnerie in its most noble shape- has become an art, rare, which Mauviel 1830 cherishes and works hard at perpetuating, to continue to respond to an increasing demand for made to measure. To enjoy many more years, in poll position, a training center opened, in the manufacture, englobing manual shaping, hammering, tinplating, embossing. The future of this art profession is in our hands, in the hands of our apprentices, whom we welcome in our center and we train.